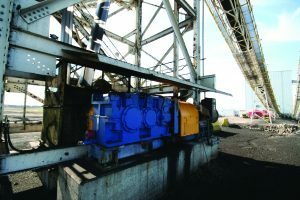 The detection and prevention of grinding burn is critical to the production of ground gears of all types and sizes. 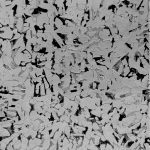 Overheating during grinding, or grind temper, results in undesirable microstructure, hardness, and stress characteristics both on and below the surface. 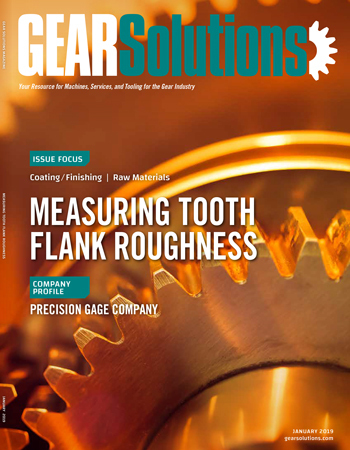 These characteristics result in failure modes on precision surfaces, which typically require high performance under load over a long lifetime. The traditional method for detection of grind temper, Nital Etch, is subjective, often destructive, and requires handling and disposal of hazardous chemicals. Additionally, the Nital Etch process requires a properly tailored process and a well-trained operator in order to prevent false-positives and/or false-negatives. 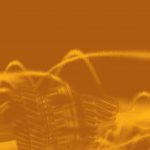 An alternative method, Magnetic Barkhausen Noise (MBN), is quantitative, repeatable, and non-destructive. Further, the MBN method is easily automated, thus removing operator influence as a variable. 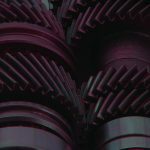 Using a sample set of carburized spur gears, ground to varying conditions of grind temper, the MBN method is demonstrated to match or exceed the detection effectiveness of traditional Nital Etch. Detection of various intensities of grind temper, including re-hardening burn, is demonstrated using fully automated MBN instrumentation. Residual Stress depth distributions measured with X-Ray Diffraction and electrochemical layer removal are utilized as a quantitative verification method. Grinding of hardened steel parts is a common and often necessary process in the manufacture of power train components. The grinding process results in components which can comply with tight geometrical constraints along with a fine surface finish. The risk, though, when performing grinding operations is a possibility of inducing grind temper. Grind temper is thermal damage of a component due to a flaw in the grinding process, which results in excessive heat generation. Excess heat dissipation into a case-hardened surface effectively tempers the surface and, in more severe cases, can create reformed untempered martensite, also known as re-hardening. The consequence of grind temper is reduced fatigue life associated with the loss of surface hardness and resulting tensile residual stresses . 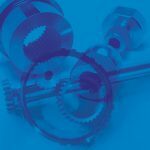 Detection of grind temper is a critical capability for manufacturers of precision steel components. Traditional methods include Nital Etch, X-ray Diffraction Depth Distributions, and metallography. 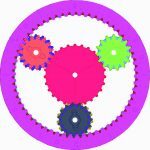 These methods have their own flaws, though, as they can be subjective, time consuming, insensitive, and they are often destructive. 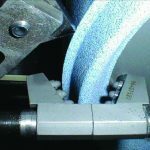 Magnetic Barkhausen Noise (MBN), on the other hand, is a non-destructive testing technology which allows for sensitive, objective detection of grind temper in a fully automated package. Efficacy of MBN for the detection of grind temper on carburized gears is demonstrated by directly comparing MBN measurements to X-ray Diffraction Residual Stress Depth Profiles (XRD RSP). 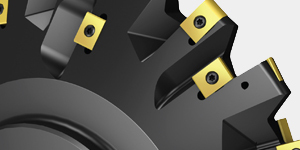 Furthermore, methodology is hypothesized and verified for the detection of extreme re-hardening, which is a traditionally difficult application for MBN users. The sample set consists of select teeth from a single spur gear. 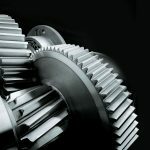 The AISI 3310 grade gear was carburized and hardened to nominal hardness of 60 HRC and then form-ground. 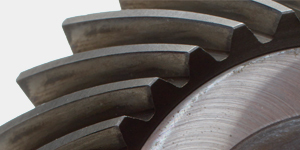 In order to vary the condition and quality of the sample set, the form grinding process was performed using a single pass for each tooth space without dressing the wheel as it proceeded around the gear. 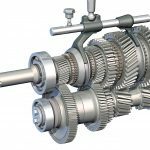 The end result is a progression of heat introduced from the grinding operation when proceeding around the gear. The MBN testing was performed using a Stresstech Rollscan 350 Barkhausen noise analyzer, a wedge- shaped sensor suitable for gear tooth surface testing and a GearScan 500 system for automated tooth scanning (Figure 1). Automation with the GearScan 500 system allows for rapid and consistent scanning along the face width of each tooth, a necessity in order to achieve repeatable results. 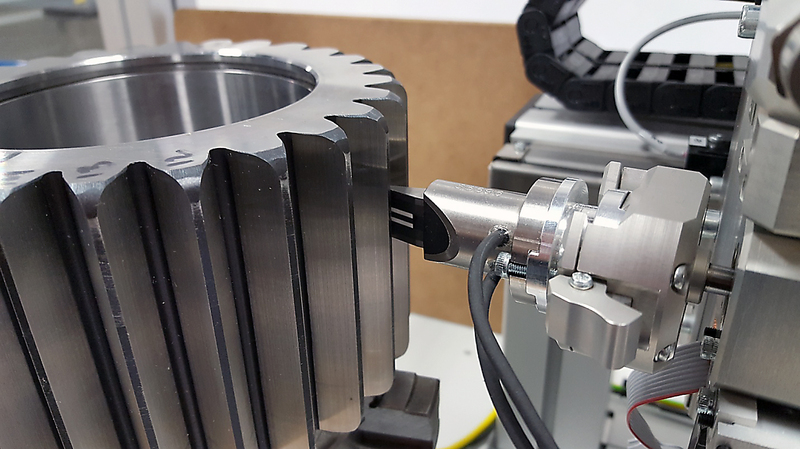 Figure 1: Automated MBN inspection of spur and helical gears with the Gearscan 500 system (not representative of parts tested in this study). For this experiment, spatial sensitivity was achieved by making nine evenly spaced scans along the face width, progressing from the form diameter of dedendum (scan #1) to the tooth tip (scan #9). The cross-sectional contact of the sensor covers approximately 10mm x 2mm. 660 data points were collected as the sensor scanned along the face width. The end result is a mapping of the entire tooth surface. XRD RSPs are a destructive measure of the residual stress through the depth of a sample. They are typically used for detection of grinding burn and have several advantages over other methods. XRD is quantitative as compared to etch, which is subjective. XRD is sensitive to stresses and, via peak width measurements, sensitive to microstructure changes, compared to cross-sectional microhardness, which is only sensitive to hardness. 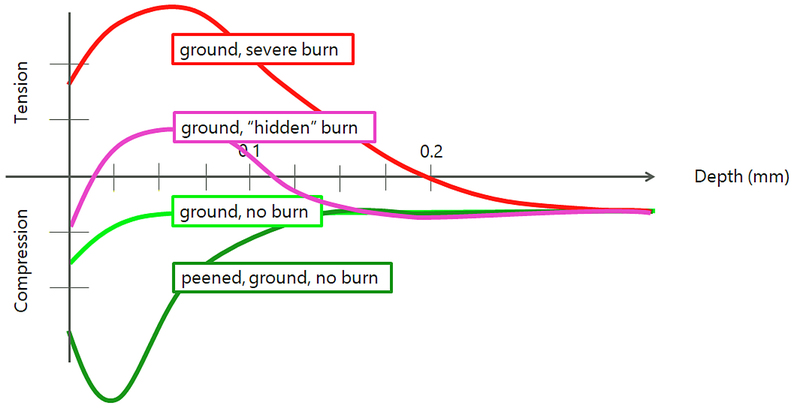 Figure 2: Example of stress effects of hidden burn. XRD RSPs were measured using a Stresstech XStress 3000 G2R diffractometer along with electrochemical layer removal for through-depth measurements. Residual stress measurements were made in accordance with ISO EN15305:2008, utilizing a modified-χ geometry . Material properties for XRD RSP calculations include Young’s Modulus of 211000 MPa and Poisson’s Ratio of 0.3. XRD measurements were made with a 3.0 mm spot size and were aligned to measure stresses in the lead direction of the tooth. 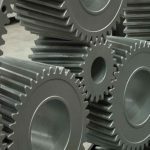 Using the aforementioned measurement automation, MBN signal root-mean-square (RMS) data was collected across the gear flank surfaces, allowing for generation of MBN surface maps. MBN RMS, known in the industry as the magnetoelastic parameter (mp), is a measure that is tailored for sensitivity to grinding re-temper burn. In the case of tempered microstructure, there are two mechanisms at play that increase the MBN RMS measured value. 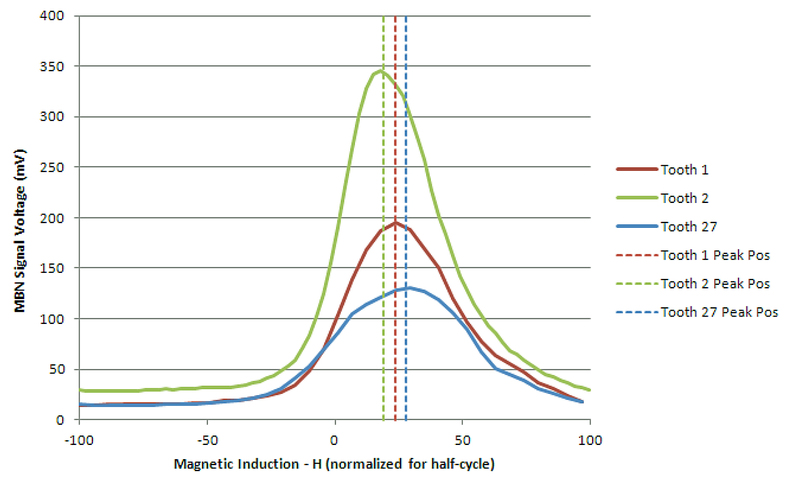 A softer microstructure, which includes transformation of martensite to ferrite, is easier to magnetize by way of a lower magnetic coercivity, thus resulting in a greater MBN RMS . 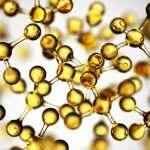 Additionally, the tensile stresses that result from grind temper affect magnetic properties in a similar way as tensile stresses create easy magnetizing axes in iron-based alloys . The end result is a higher MBN RMS when grind temper is present. Figure 3: MBN RMS surface map from Tooth 1, coast flank. Tooth 1 from the sample set is ground under ideal circumstances and, as seen in the surface map in Figure 3, exhibits a low and homogeneous MBN RMS across the entire coast flank surface. Tooth 9, however, was ground with a wheel in need of dressing (Figure 4). This coast flank exhibits elevated MBN RMS values along with non-homogeneity across the surface — typical indications of grind temper. Figure 4: MBN RMS surface map from Tooth 9, coast flank. MBN RMS surface maps can be used to more effectively sample data sets for other time- and labor-intensive test methods, such as XRD or metallography. 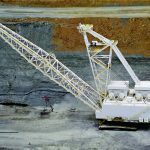 In this study, MBN RMS surface maps were used to more effectively choose measurement locations for XRD RSPs in order to characterize the spectrum of grinding defects. XRD RSPs were measured using electrochemical layer removal through the depth. Depth values between 0.0 mm and 0.20 mm were selected in accordance with traditional grind temper evaluations via XRD RSPs. 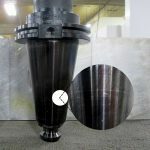 Except in cases of very high intensity grind temper, the effective depth of grinding stress is typically less than 0.20 mm and is weighted more toward the surface. As a result, more data points are collected near surface, where gradients are steepest, while depth resolution is decreased as depth is increased. Typically, in the case of a good grinding process with no thermal damage, the residual stress remains mostly neutral or somewhat compressive on the surface and also through the depth. Grind temper usually creates a subsurface stress peak, often slightly tensile, while converging toward zero stress through the depth. The depth at which the stress reaches neutral or slightly compressive depends on the depth of the thermal damage or, in other words, the intensity of the grind temper. 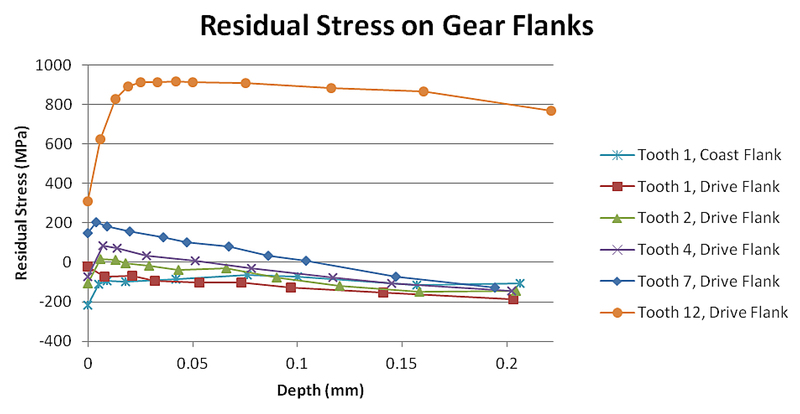 Figure 5: XRD Residual Stress Depth Profiles on gear flanks. As can be seen in Figure 5, grind temper damage increases sequentially with tooth number. Subsurface stress peaks are observed in all samples except Tooth 1 (both drive and coast flanks). Tooth 12 has been subject to significant thermal damage and does not reach a neutral or somewhat compressive stress within the 0.20 mm measurement depth range. MBN is an electromagnetic test method which, similar to many non-destructive methods, is relative in nature. 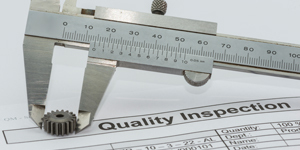 In order to properly leverage MBN as a process tool, the user must use reference samples or verification methods to initially set up both measurement parameters and evaluation criteria. A typical method for accomplishing this task is to compare MBN RMS measurements to XRD RSP data. 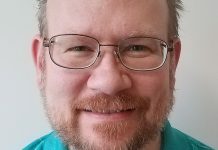 Specifically, comparing the MBN RMS value for a particular location to the maximum subsurface residual stress within the grinding-affected depth is considered to be the best practice. For the sample set in this study, MBN RMS surface maps were used to select locations for XRD RSPs. At each location, the MBN RMS and the maximum subsurface residual stress within the first 0.050 mm were compared, yielding the chart in Figure 6. Figure 6: MBN RMS vs. Maximum subsurface residual stress in the first 0.05 mm. As can be seen in Figure 6, there is agreement between MBN RMS and maximum subsurface residual stress with one exception. An MBN user would likely use an upper limit of approximately 130 mV as rejection criteria, based on MBN results and corresponding residual stress data. The only samples tested that do not have subsurface tensile stress peaks are Tooth 1 coast flank and Tooth 1 drive flank. 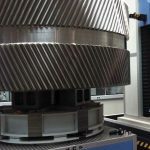 An upper limit of 130 mV allows both acceptable grind samples to be accepted while also rejecting the remaining samples. 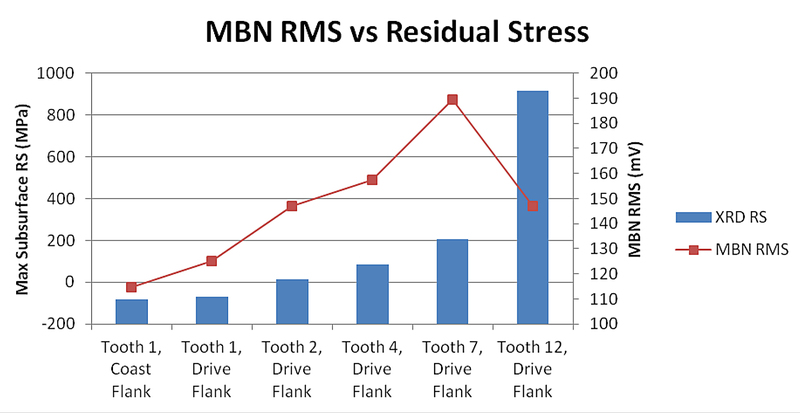 The anomaly in the correlation, Tooth 12, drive flank, shows a decrease in MBN RMS despite a very large increase in subsurface residual stress. 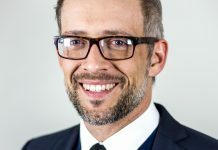 While the grinding conditions that resulted in the damage to Tooth 12 are extreme and not often found in the industrial environment, there still exists a need to properly sort out these defects. In some cases, grinding-induced thermal damage is so great that the material surface is heated past the austenitizing temperature, only to then be quench-cooled by grinding coolant. The end result is what is known as grind re-hardening. This typically includes, as one examines through the depth, a surface layer of untempered martensite followed by a tempered zone with softer ferrite phases, before finally reaching the hardened case. 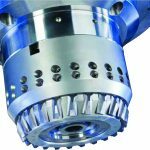 Grinding re-hardening can be detected with traditional methods, including XRD RSPs. Seen in Figure 7 is an XRD RSP along with XRD Diffracted Peak width through the depth of the measurement on Tooth 27, drive flank. Tooth 27 represents the highest level of grinding damage in the sample set, thus having exaggerated depths of damage as compared to typical production-ground components. In addition to residual stress data, the XRD RSP measurements produce data that relate to the microstructure of the volume measured. Diffracted peak width (FWHM) is an indicator of microstructural refinement, or lack thereof, and FWHM increases with crystal lattice imperfection, dislocation density, etc. The end result of this relationship is that very high FWHM is observed in cases of untempered martensite while very low FWHM is observed in cases of soft ferrite. Consequently, FWHM is a useful indicator of microstructure transformation. In general, there is agreement between the XRD Residual Stress and FWHM data, with higher subsurface stresses correlating to a lower FWHM. This relationship it typical in the case of grind temper, as the microstructure transformation which lowers the FWHM also creates the subsurface residual stresses. 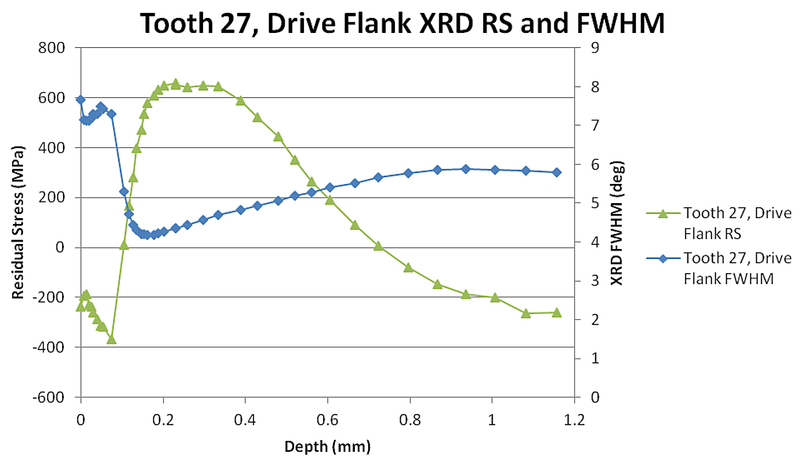 Figure 7: XRD FWHM Depth Profiles on gear flanks. Detection of grind re-hardening via MBN is often as simple as detection of grind tempering with one caveat: higher intensity damage does not necessarily increase the MBN RMS measurement. In fact, often the MBN RMS measurement will decrease as re-hardening damage increases. This is due to the re-hardened microstructure possessing a very high magnetic coercivity, which makes it much more difficult to magnetize. In order to best detect cases of extreme re-hardening burn, the MBN peak position can be used. MBN peak position is the phase position of the MBN peak with respect to the applied magnetic field H. It is often correlated to magnetic coercivity. As a result, it is able to be sensitive to the changes in magnetic coercivity that accompany grinding re-temper burn and grind re-hardening. As seen in Figure 8, the Tooth 2, drive flank MBN peak increases in height (higher MBN RMS) though its position shifts lower, relative to Tooth 1, drive flank, in the case of re-tempering. In the case of re-hardening with Tooth 27, the peak decreases in height but also shifts to a higher position, which is expected with the untempered martensite, resulting in higher coercivity. Figure 8: MBN Peaks with vertical lines denoting peak position. Plots by color: Tooth 1, drive flank is red; Tooth 2, drive flank is green; and Tooth 27, drive flank is blue. 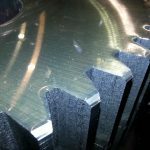 Proper detection of grind re-hardening, in addition to grinding temper, is achievable in cases where traditional MBN measurements are not sufficient. In these cases, the MBN peak position can be used in addition to MBN RMS to detect any case of grinding thermal damage. It has been demonstrated that MBN is an effective technology for detection of grind temper, specifically on carburized gears. MBN measurements were successfully corroborated with XRD RSPs. 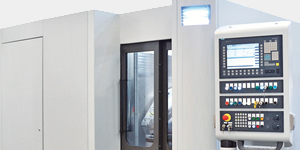 Using automation to precisely control sensor positioning, contact angle, and scanning speed. These are issues that are always a challenge when measuring by hand. The use of automation results in repeatable measurements which allow subtleties such as peak position variations to be detectable. Additionally, using MBN peak position analysis cases of extreme re-hardening were analyzed and were successfully detected, even in cases where traditional MBN measurements are ineffective. 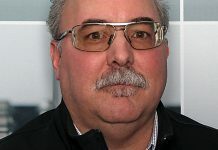 Gorgels, C., Klocke, F., and Schröder, T., “Influence of Grinding Burn on Pitting Capacity,” Gear Technology, August 2008. Ding, Wenfeng, Zhang, Liangchi, Li, Zheng, Zhu, Yejun, Su, Honghua, Xu, Jiuhua, “Review on grinding-induced residual stresses in metallic materials,” International Journal of Advanced Manufacturing Technology, May 2016. Kleber, X., Hug, A., Merlin, J., Soler, M., “Ferrite-Martensite Steels Characterization using Magnetic Barkhausen Noise Measurements,” ISIJ International, Vol. 44, 2004. 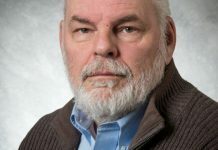 Mierczak, L., Jiles, D. C., Fantoni, G., “A New Method for Evaluation of Mechanical Stress Using the Reciprocal Amplitude of Magnetic Barkhausen Noise,” IEEE Transactions on Magnetics, Vol. 47, February 2011.